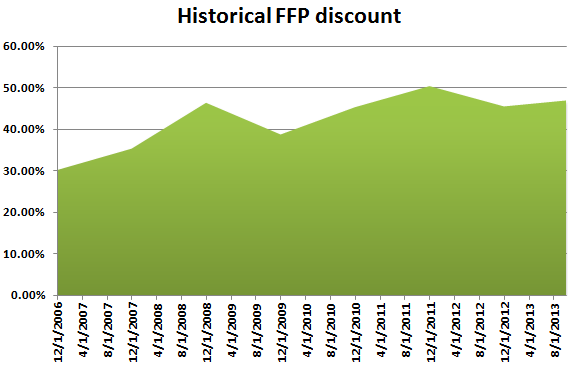 A reader asked in what range the FFP discount to NAV has been historically, and that seemed like a good question to answer with a graph. I couldn’t easily find historical NAV data from before 2006, but what we do see is that the discount has been smaller in the past, and that the current discount of nearly 50% is at the top of the historical range. It would also not surprise me if the discount has been smaller than 30% if we would look further back. While this is of course encouraging to see I don’t think it’s extremely important. A 50% discount is a 50% discount, regardless of the past, and I have looked at enough holding companies to know that this kind of discount is big. This entry was posted in Portfolio and tagged FFP.PA on October 28, 2013 by Alpha Vulture. The spreadsheet you see here is publicly accessible on Google Drive using this link and updates automatically all share prices and the current discount. Not all assets in FFP are publicly traded, and since the CAC 40 index is up ~15% since the end of June the real discount to NAV is most likely hitting 50% at this moment. This is basically the whole investment thesis! 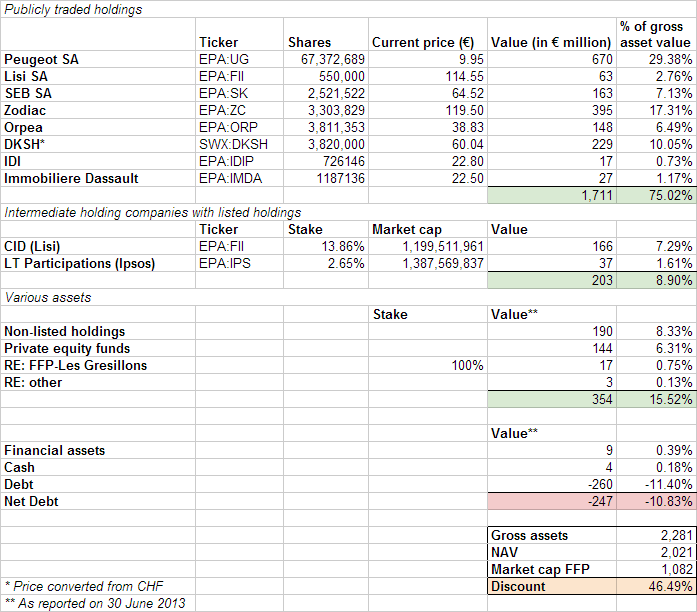 I could write thousands of words about the valuation of the individual companies inside FFP, but the truth is that I don’t really care. The companies that FFP owns have market caps in the billions of euro’s, and I do trust the market to some degree. 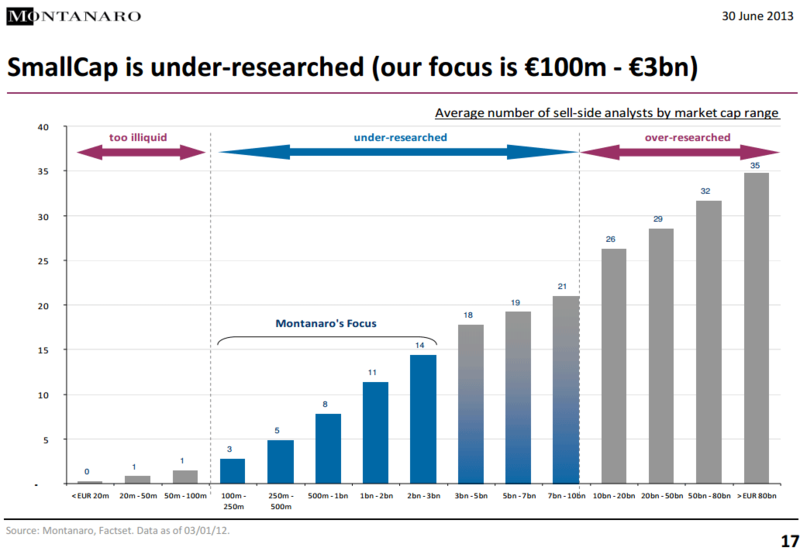 What’s positive to see is that FFP appears to have a good track record with their investments outside Peugeot. As you might know the family business isn’t doing very well these days, and if you would have invested in Peugeot 5 years ago you would have lost half your money. If you would have invested in FFP on the other hand you would have made more than 20%, a remarkable achievement given the huge historical stake in Peugeot. What I do want to discuss is why I like an investment at a big discount in a holding company, even though I don’t expect that this discount will disappear anytime soon. The Peugeot family owns almost 80% of the holding company so there is no way an outside investor can pressure the family to do something to eliminate the discount, and the family is presumably not extremely interested in the market price of FFP since they are holding this for the very long term. FFP is the vehicle that allows them to control Peugeot SA: their legacy. I don’t think this really matters though. Even if the discount would never get smaller you buy a company that can support a dividend steam that is twice as high as the underlying assets. And that is what ultimately determines intrinsic value: the dividend stream back to shareholders. You don’t need to sell a stock at a higher price to realize value: if you buy cheap and just hold you will simply enjoy an above average yield. While there is nothing wrong with holding a stock till infinity I actually don’t think that you have to do this. At some point in time the market will probably realize that a 50% discount isn’t warranted. Last year FFP didn’t pay a dividend because of the poor results at Peugeot and the re-initiation of a dividend could possibly act as a catalyst. I also assume that the Peugeot family doesn’t hate money. The undervalued shares represent an easy opportunity to make money if they start a repurchase program. You also have to figure that there is probably going to be some point in time when the Peugeot family wants liquidity. They would be stupid to sell their FFP shares at a 50% discount when they could for example divest some assets and realize NAV. Since I think they will care about the NAV discount at some undetermined point in the future you can expect that it will eventually be eliminated. It’s going to take a lot of patience, but I don’t mind that if I’m owning an asset that has intrinsically a yield twice as high as the market average. The investment thesis in FFP is extremely simple. The holding company trades at a 50% discount to NAV, and I don’t think such a large discount is warranted. Luckily I believe that the simpler the investment thesis, the better, and it doesn’t get any simpler than this! Rating: on a scale from one to five I’m going to give this idea two stars. The thesis in FFP shares many similarities with Burelle: both are French, family controlled holding companies at a ~50% discount with a focus on the automotive industry. An identical rating is logical. I suspect that a lot of my readers also visit the Whopper Investments blog, so you might have noticed that I gave this post an identical title as his last one: Incentives matter. Whopper summarizes my thinking about the subject in the following sentence: “I believe that people are always going to do what’s in their best interest”. This is of course very important when you scrutinize what insiders are doing at a company, but it is equally true when you read an article online. What are the incentives of the author? I recently wrote a post for Seeking Alpha about Deswell Industries. For regular readers of my blog not a new name since I own it since the beginning of 2012. At the time I spend little time about looking at the underlying business, my main concern was whether or not the company was potentially a fraud since it’s doing business in China. SA pays authors a minimum of $150 dollar for a good article on a under-followed micro/small cap while there is minimum payment of $500 dollar for an article that is selected as an “Alpha Rich” idea. So what is your incentive as a writer: to write a piece that convinces the SA editors that the stock offers an asymmetrical risk/reward ratio! It’s no longer about publishing the most balanced research. Of course you should mention some negatives because you sound smarter if you do, but it’s easy to downplay a specific issue. I wish it wouldn’t be true, but after writing the article I realized how you are tempted to do it. Even without the money the incentive would be there: it’s also an ego thing. In the case of Deswell Industries I don’t think it would have been too hard to write an article that sounded a lot better. You have the downside part of the story covered with the large amount of cash on the balance sheet, and it’s easy to write for example a nice story on how the business has decent long-term prospects (not impossible) or how the leasehold land of the company could potentially be a very valuable asset (for the record: I don’t think this is very likely, but you see on SA a reader that is trying to make this case). It doesn’t even matter if you fool the SA editors or not, the end result is the same. My number one motivation of starting this blog is to improve my investment process and skills. I often think about my write-ups as a sort of public visible checklist (without the checks). By writing an ‘exclusive’ article for SA I’m giving myself a competing incentive, and that is a dangerous thing because it’s already easy enough to be biased towards your own idea’s. So you don’t have to expect a lot of other SA articles from me in the future, although I might occasionally review an existing position (or maybe write about something I don’t own). A slightly related topic is my decision to keep the blog free from advertisements. That would also introduce a competing incentive: away from the quality of posts and towards the quantity of posts. I don’t think advertising revenue would be material anyway, so no reason to do something that subtracts from the main goal of the blog. What should it mean for you? Nothing! You should be doing your own thinking and research anyway. But when you read something it still pays to think about the incentives of the writer, because it can tell you where you could start looking to find the weak points in the thesis. Unfortunately this means on SA that authors have an incentive to make the story sound as positive and convincing as possible. I understand why they are doing this, because it’s at the same time also an incentive for people to write true “Alpha Rich” articles, and I think they are succeeding with that part of the equation. I do see more interesting articles appearing than in the past. This entry was posted in Off Topic on October 11, 2013 by Alpha Vulture. This is of course not anything new, but just a nice illustration of how the smallest stocks attract little interest from professional investors. If they think small caps are already under-researched it’s clear that nano/micro-caps are even less efficiently priced. That’s exactly the corner of the market were I’m trying to find my idea’s, and I think that should make sense for most serious individual investors. The market doesn’t pay you based on how smart the guy at the other side of the trade is, so no point in making investing harder than it needs to be. Individual investors usually don’t have a huge amount of money that needs to be put to work so if the average trading volume per day is a couple of thousand dollars worth of shares it should be possible to build a position without any problems. With some patience you can buy even less liquid stocks. Something that is truly uninvestable is pretty rare. What’s of course important when you buy illiquid stocks is that you know that you won’t be forced to exit your position at an inopportune time. The professional portfolio manager often has to worry about clients that want to withdraw at exactly the wrong time, making investments in illiquid stocks less desirable. I don’t think you should be invested in the stock market if you don’t have a long time horizon, so when you invest in something you might just as well capture a liquidity discount. No reason to pay for something you don’t need! This entry was posted in General on October 9, 2013 by Alpha Vulture.